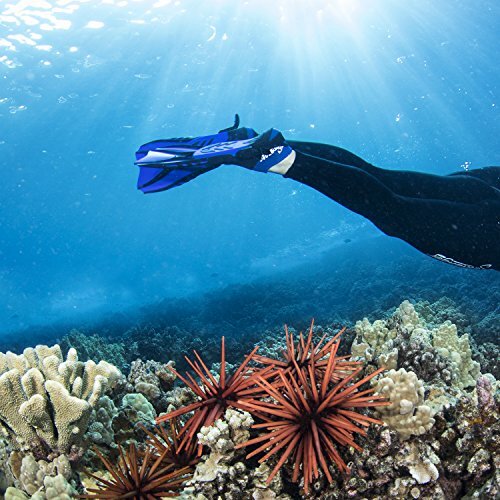 Here's our revised list of best neoprene socks for snorkel and diving in 2019. Our top choices are based on verified experiences and user test results. What are neoprene water socks? Why do socks have "4-way" stretch and why is it important in your snorkeling sock? Neoprene dive socks come in short, medium and long ankle heights for snorkeling, scuba diving, and even hiking in water. They also come in different thicknesses from 1-5mm for warmth and protection. We will go through different options for different conditions in this article. 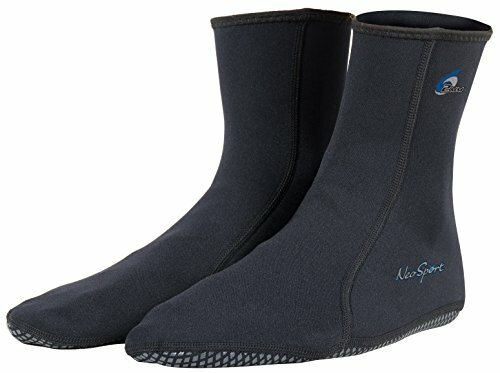 Made from 2 millimeter neoprene rubber and is fabriqued in a 4-way ultra soft stretch, the Neosport Wetsuits Premium Neoprene 2mm Neoprene Water Sock is one of the most flexible and stretchable neoprene socks available. It’s 4-way fabric stretch means that you can stretch the material either towards the front, back, left or right. In short, no matter what shape or contour your feet has, once fitted on, it will create a complete seal that guarantees to keep your feet warm and prevent accidental cuts and abrasions. Its heat retention capabilities has considered them to be one of the best neoprene scuba socks. It is also prefered in other sports like snorkeling, wakeboarding, kayaking, canoeing and other aquasports that generally has a cold-water environment. 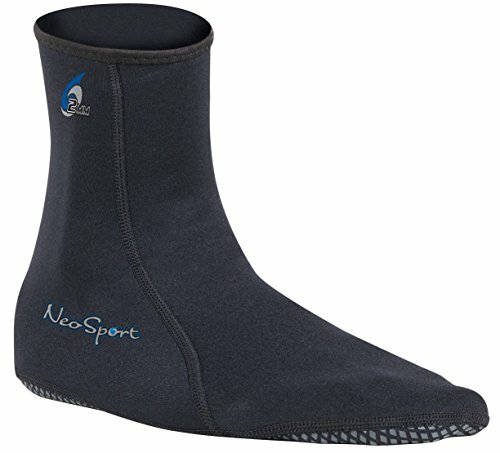 In cases of extreme water temperature, the Neosport Wetsuits Premium Neoprene 2mm Neoprene Water Sock is designed to be worn over with a wetsuit boots that adds more warmth to your feet. The 2 millimeter thickness of the neoprene sock is ideal for walking on a hot sandy area or rough concrete and can be easily worn and taken off without chafing your feet against the neoprene material. While these socks has a relatively thin sole, it still provides good grip on the ground courtesy from its double traction neoprene sole. The only downside of this footwear is that its size specification is preferred for men’s use. With this, many female customers have ordered the wrong size, and more often than not, they often get a bigger size neoprene socks. So, we highly advise you to be cautious when selecting the size and having a 0.5 to 1 inch reduction would be recommended for a proper fit. Further, please take note that the Neosport Wetsuits Premium Neoprene 2mm Neoprene Water Sock comes in a low-cut and high-cut design. So please choose correspondingly based on the water environment you are exposed to. For example: low-cut designs are perfect for the tropics and the high-cut design are best for temperate, cold water regions or in muddy areas. If there is one fin sock that can be considered one of the best snorkeling socks, then nothing beats the H2Odyssey Mini Sock2mm Unisex Fin Sock. As the description tells us, these socks are ideal if you are wearing snorkeling fins of the full-foot type. This is courtesy from its ultra-soft neoprene material that has a thickness of only 2 millimeters. Many have compared these neoprene socks with just like wearing your regular socks. 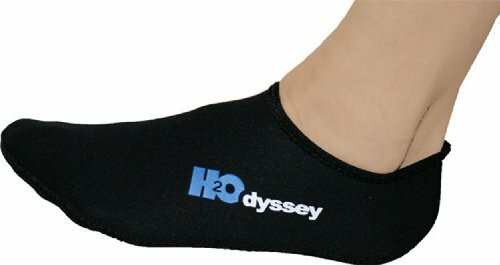 Instead of cotton, the neoprene material of the H2Odyssey Mini Sock2mm Unisex Fin Sock is uniquely fabrique that it is shaped to fit your feet comfortably. It’s low cut design allows you to wear this footwear easily without suffering the painful effects of chafing. Once your foot is inside the socks, you will appreciate its non-slip bottom where it is very efficient in giving you a nice grip while walking on slippery grounds. Same with the previously mentioned neoprene sock, the problem with the H2Odyssey Mini Sock2mm Unisex Fin Sock is that it is unisex and it does not have a size chart for men and women as both gender differs in foot size metrics. The only size differentiation that you will see in these snorkeling socks is that it is available in small, medium and large sizes. For reasons of size benchmarking, large size will fit a men who have a size 9 foot and size 10 for the ladies. For size 7 mens and 7.5 for the ladies, the medium size will have a perfect fit. There is also an inquiry about the suitability of fin-type as the description of this snorkel sock will tell you that this is a fin sock. Yes, this is a fin sock but it is only recommended for use with a full-foot type of fins. In case you are using the open-heel type of fins and you use this low-cut fin socks, the tendency is that the fin strap will definitely come in contact with your skin especially on the part of the upper heel and near the tendon of achilles. This situation will become worse if you are wearing a large fin size and you need to tightly adjust the fin strap where the material of the shoe pocket of the fins will press the bridge portion of your feet where some have reported swelling if used persistently over time. Comparing these socks, at a first glance, to other neoprene products previously mentioned, it seems that it features nothing special. Yes, that is true. In fact, many have considered the Seavenger 3mm neoprene socks one of the simplest aqua socks ever made. But if you try to take a closer look, both in the snorkel socks itself and from its description, you will realize that its simplicity is also coupled with durability and effectivity. These neoprene socks for snorkeling is made from a high quality 3 millimeter thick neoprene rubber that is glued and stitched. But not just simple stitching. It is architecturally stitched using the blindstitch method that increases snorkeling socks durability while minimizing the flow of water. This feature, in turn, provides good insulation especially if your feet is exposed in cold water environment making these dive socks very efficient in conserving body heat. Initially, many have thought that the sturdy stitching of the Seavenger 3mm neoprene socks will make it hard to wear. But after wearing one, many has also been surprised how this swim socks can easily be worn courtesy from its 4-way stretchable material that will easily conform to the contours of your feet. Given that these socks are made up of neoprene rubber, it is assumed that it can provide you optimum traction while walking on slippery environments. 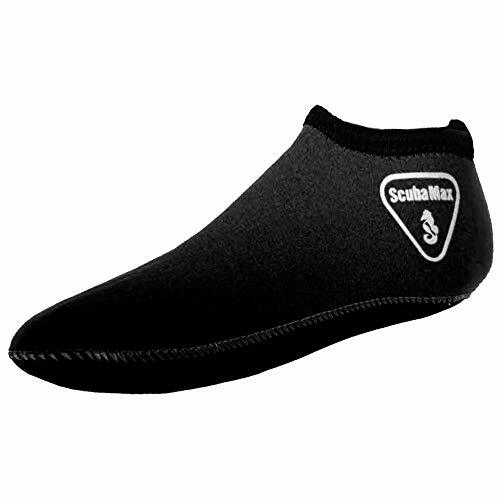 But the designers are not contented with this simple feature that they added a dotted silk screen sole that adds to the maximum traction and grip of this scuba diving socks. And with this, socks has become a favorite foot accessory for many sports enthusiasts who are in to snorkeling, diving and kayaking. And not just water sports, but many have also used the Seavenger 3mm neoprene socks in land-based sports like yoga and aerobics. Same with other neoprene socks, you have to be aware that size availability of these neoprene footwear only comes in small, medium and large. For a quick guide: small size would fit a foot size ranging from 5 to 6 ; medium from 7 to 9; and large from 10 to 12 inches. Comfort and fit are the basic characteristics that you need to consider in selecting a neoprene sock. However, you can also consider a design that is streamlined and walking in the water is as a similar as effortless. That’s the feeling when you use the Fun Toes 2.5MM Neoprene Socks for Water Sports Snug Fit for Women and Men courtesy from its streamline design. Taking a close examination at the water socks, you will notice that there are only 2 major stitch path: one running at the top center of the footwear and the other binding the sole and the back portions of the heel. The minimal stitch path, which directly comes in contact with the water, decreases water friction thereby decreasing drag that significantly decreases effort when walking on water. 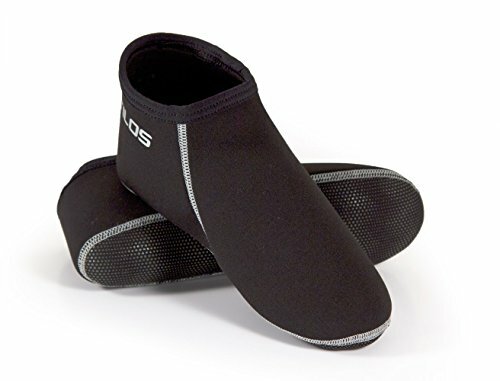 Perhaps, another feature that contributes to the streamline characteristic of the Fun Toes 2.5MM Neoprene Socks for Water Sports Snug Fit for Women and Men is the thin material. Compared to other neoprene socks, Fun Toes is only made of a thin neoprene rubber with a thickness of only 2.5 millimeter where it gives a lighter feel as compared to a 3-millimeter thick neoprene socks. Just a simple reminder: due to its thin sole, these socks are not designed for water hiking or long stroll in pavements that generally has a rough to sharp surface as it can potentially damage its light material. If your playground involves a predominantly cold water ecosystem or areas with temperature lower than 15OC (60OF), then you are required to wear a thick neoprene socks such as the Neosport Wetsuits XSPan 5mm Socks. These 5 mm neoprene water socks are considered as the ultimate neoprene gear in terms of thermal regulation and prevention of body heat loss. This feature is brought to you by its thick 5 millimeter neoprene rubber that is considered one of the thickest as far neoprene socks is concerned. But it is not just being thick. It’s neoprene material is embedded with its trademark XSPAN fabric-lined socks that adds an additional layer of protection and warmth. 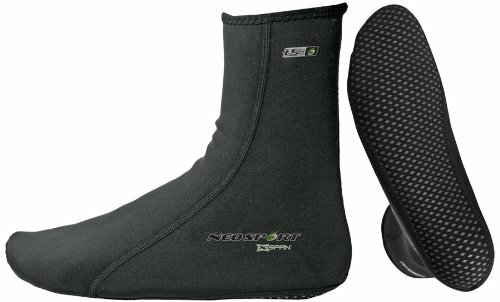 In cases of extreme weather condition, the Neosport Wetsuits XSPan 5mm Socks is designed to be worn over with any street shoes, boots and waders that will definitely keep your feet warm on a very cold day. Moreover, for added thermal regulation, this neoprene sock is presented in a high-cut design, where when worn under, becomes the perfect partner for your 5 millimeter wetsuit or drysuit and many has considered this one of the best neoprene dive socks. Looking at its 3 millimeter specification, it will give you an initial impression that this is just another ordinary neoprene socks. But wait, did you know that this is one of the few neoprene fin socks out in the market that uses the highly durable and stretchable Nylon II Neoprene? If no, then read along as we present to you why the Tilos 3mm Waterproof Neoprene Fin Socks has become a bestseller where its users have considered it one of the best snorkeling fin socks. With regards to height, these are one of the snorkel fin socks that comes in a mid-cut design. It falls in between low-cut and hi-cut that can be used in any aquatic environment, regardless of terrain or topography, and without suffering the difficulties of wearing or taking off as what hi-cut scuba fin socks does or the vulnerability of low-cut footwear to sand and rubble intrusion. Going back to the Nylon II neoprene material, the Tilos 3mm Waterproof Neoprene Socks is made from a highly elastic rubber that has been bonded on a nylon fabric on both sides. The combination of these materials has made these fin socks for snorkeling highly durable even on frequent and extreme use. With this, you have to remember that some neoprene socks uses a thin fabric called lycra where they bond the neoprene rubber where this material combination can easily be worn-off over time. On top of this, the Tilos 3mm Waterproof Neoprene Fin Socks is one of the few that claims a breathable feature. This is due to its unique neoprene ventilation that provides both ultraviolet and thermal protection. In general, this prevents the onset of a clammy feel especially when your socks are exposed to direct sunlight and internal temperature of the neoprene starts to build up. Another feature that divers and snorkelers alike most appreciate about this is the vented rubber sole that allows water to flow with the exclusion of sand and rubble giving you a cooling and refreshing fell once you submerged this neoprene swimwear on the water. If there is one feature that stands out about the Cressi Short Premium Neoprene Diving Socks 3mm, it has something to do with its anti-slip characteristics. Manufactured by the famous Italian scuba gear and accessory maker, these socks are designed for scuba divers, skin divers and snorkelers where, often than not, their environment is predominantly cold, wet and slippery. Focusing on the sole, it has been made with a durable rubber that has a grip sole design and anti-slip properties which is perfect when you walk along the algae infested jetty or the slippery fiberglass of the boat. 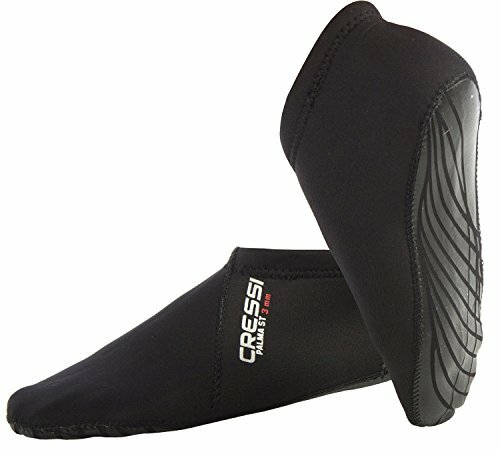 This anti-slip property of the Cressi neoprene scuba socks is very much appreciated by divers especially when the moment comes where they need to surface up, go back to the boat and climb up the slipper ladders. As for the aspect of scuba diving and snorkeling, the Cressi Short Premium Neoprene Diving Socks 3mm goes in perfectly with any full-foot type of fins. Further, this neoprene socks having a 3 millimeter thick material, can also be used with the open heel type of fins where many of its user find the neoprene material very efficient against scratch and wounds from direct contact with the fins hard plastic. The ScubaMax 3mm Snorkeling Scuba Diving Fin Low Cut Neoprene Sock is one of the bestselling neoprene fin socks where most of its users are dive professionals and scuba enthusiasts. Its 3 millimeter neoprene material is designed and shaped to fit the average foot contour giving you a comfortable feel. Not to loose and not to tight. In other words, just the right tightness. Many of its users shared their experience that, when they use the ScubaMax 3mm Snorkeling Scuba Diving Fin Low Cut Neoprene Sock, is just like wearing your daily ordinary cotton socks. While sitting down at the beach, you can easily slip on your foot without exerting much effort. While many of its users are professional divers, there is a growing number of users that are just simple beach goers who have greatly appreciated its optimum fit while walking in the sand or in the water. Everyday socks are made of cotton and the primary purpose is to protect our feet, absorb perspiration and prevent chafing cause by the constant rubbing between our foot and the material from the footwear we use like shoes. But how about socks that are made of neoprene? Neoprene socks are not worn with shoes on land, but rather, is worn as a standalone foot accessory when we expose the lower extremities of our body to any aquatic environment such as rivers, lakes and the ocean - for instance we can use neoprene socks for hiking in water. Aside from foot protection against rocks and other solid or spiny objects, neoprene dive socks are worn to prevent body heat loss. This purpose is relatively important and applied in instances where the surrounding area is significantly colder than our body temperature as in scuba diving. In cases of cold water environments, wearing neoprene scuba socks will trap our body heat and concentrate that heat in our lower extremities where the possibility of heat dissipation is reduced to the minimum. But without wearing neoprene socks, body heat temperature will dissipate through our extremities, which in this case our feet, where prolonged exposures can lead to lowered body core temperature, shivering and hypothermia in a worst case scenario. We have to admit that both neoprene socks and water shoes share the same common purpose - to protect our feet. But if we give extra attention and try to differentiate these two footwears, you will realize that there are a couple of differences that may answer one’s preference. Sole - this is one of the obvious differences between the two footwears. Water shoes has soles that are made up of hard rubber while neoprene socks does not have one. And if there is one, it is made out of a thick neoprene material and not rubber. The difference for a having a thick or thin sole will lead to the flexibility of the footwear where neoprene socks are more flexible compared to water shoes. Aqua Mesh - a net webbing is a predominant feature for water shoes as it filters out and prevent sand, pebbles and other small debris to enter and come in contact with your feet. On the other hand, neoprene socks are completely covered with a highly flexible material that sand and pebbles virtually cannot go through. However, once sand and pebbles accidentally enters, getting rid of the foreign object requires you to completely take off the footwear and remove the object manually. Breathability - given the fact that water shoes and neoprene socks differs in having a sole and a aqua mesh, this difference could also lead to breathability. Water shoes may have a holed-sole and a nylon webbing the contributes to the overall breathability of the footwear, neoprene socks (without having those features) has less breathability. However, in extreme water temperature, neoprene socks are better appreciated as they retain more heat as compared to the open water circulation of water shoes. While given the fact that neoprene socks don’t have aqua mesh or holes in the side where sediments and other fouling objects can enter, it does not mean that you don’t need to wash your neoprene socks. If you do so, then expect to smell a fouling odor just hours before it is completely dried up. But washing your neoprene sock does not just involve rinsing. Remember that the water environment you just have been exploring contains bacteria and other microorganisms, that when left alone and settled in your neoprene socks, can cause a fouling odor. This is on top of the sediments and the perspiration from your feet. We highly advise that the moment you get back home, or if possible while still on site, rinse your neoprene socks thoroughly with freshwater. It would be better if you soak it in soap, liquid detergent or a shampoo that is specifically formulated for neoprene use. After soaking your neoprene socks for a couple of minutes, you need to rub all the areas of the footwear and squeeze afterwards so that all fouling agents will be expelled. This technique is particularly helpful since neoprene has less breathability and by not rubbing and squeezing, would left the fouling agents set deep inside the material. After rubbing and squeezing, rinse thoroughly with freshwater and squeeze out excess water that is left behind. With regards to drying up your neoprene socks, do not dry it up under the direct heat of the sun, otherwise you will damage the material which can become brittle in the process. “Air Dry” is the most advisable way to dry up your neoprene socks, similar to what we do with our wetsuit that is made up of neoprene. To facilitate drying, you can further use dry cloth, old newspaper or even a hair-dryer where you are guaranteed to wear a dry and clean neoprene socks the next day. And by the way, who wants to wear a dampened and wet neoprene socks early in the morning? Neoprene socks usually come in the thickness of 1-5mm. The reason for this is that the thinner socks will still give you the protection you need but if the air and water temperature is the same at 90 degrees Fahrenheit you want to be cooler on your feet. If the water is cooler, you want more warmth, then you will want to go with a thicker sock like the 5 mm thickness. When I say ankle socks, I am referring to socks that cover your foot but stay below the ankle bone. The standard socks come past the ankle bone and in some cases can come up your calf. There is not a big difference when it comes to length of the sock up your calf except for preference. Some people like the ankle sock so they don't get sock tans or it is more comfortable. However, if you are wearing an ankle sock and snorkeling with open heeled fins there is a chance you may get blisters from the rubbing and then you would want to go to a higher sock. Also with the standard socks in cooler temperatures they will keep the lower half of your leg warmer and if you are wearing a full wet suit it will keep it so there is no skin showing. The longer neoprene socks can also protect you against the elements of the water including some jelly fish stings or other fish that may be harmful in the water. Not only do neoprene socks provide warmth and protection but they can be worn with most open and closed heeled snorkel fins. Just as I was saying earlier the ankle socks could slip down and give you chaffing so I would recommend standard or taller socks for fins. Now if you are going out to buy snorkel fins and you are planning on wearing neoprene socks, BRING your socks with you. If you don't, you want snorkel fins to fit snug because they do expand slightly in the water but if they fit snug already and you don't try your sock on with the fins you may not even be able to get your foot inside the snorkel fin. There are also Lycra snorkeling socks which I personally recommend and they are the Deep See Lycra fin sock because they are seamless for less chance of chaffing and a one size fits most and are comfortable with open heeled fins and closed heel fins. When articles talk about 4-way stretch it means that it stretches in all directions making it form better to your foot. Everyone's foot is different in every way and the elasticity of the 4-way stretch allows it to mold over you foot so it keeps that snug feeling and eliminating water or sand getting into the sock. This prevents creating pockets that if debris or water got in your sock it could cause irritation that leads to a rash or blisters. So to conclude - socks are socks right? Not anymore really... Snorkel socks have come a long way not only as water socks but also for scuba diving and hiking in water. With all the varities now with the thickness of neoprene socks varying, or as for purpose: socks for fins, ankle socks versus standard socks and etc. we hope this article helped you choose the one that best fits your needs. At the end of the day, you have to remember that neoprene socks are just your first line of defense against the elements of nature, especially when dealing with thermal regulation. This does not guarantee you a protected walk in the park where the use of neoprene socks are only ideal for areas with smooth and flat surfaces. And please, do not ever think that you are protected with spiny objects or animals like sea urchins. Because of you do such a thing, prepare yourself with some painful consequences. 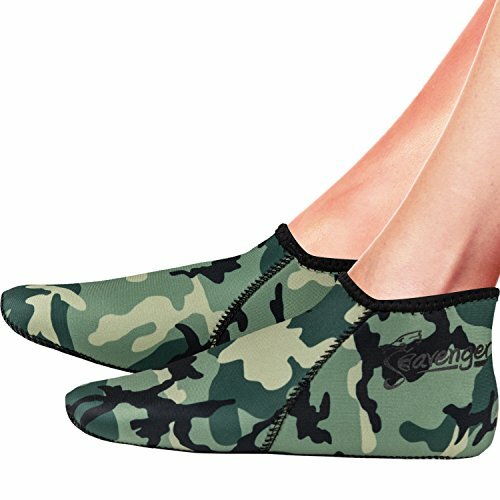 Feel free to check our best water shoes for women article as well if you are going between choosing socks or shoes for your next snorkeling vacation.